Add the finishing touches to your spooky bathroom decor with these custom printed bathroom napkins. These pre-folded paper guest towels measure 8 1/4 inches long by 4 1/2 inches wide. Custom printed with a spooky Halloween design and your own custom message. Napkins are made from non-recycled, 3-ply disposable paper. Made in the USA. 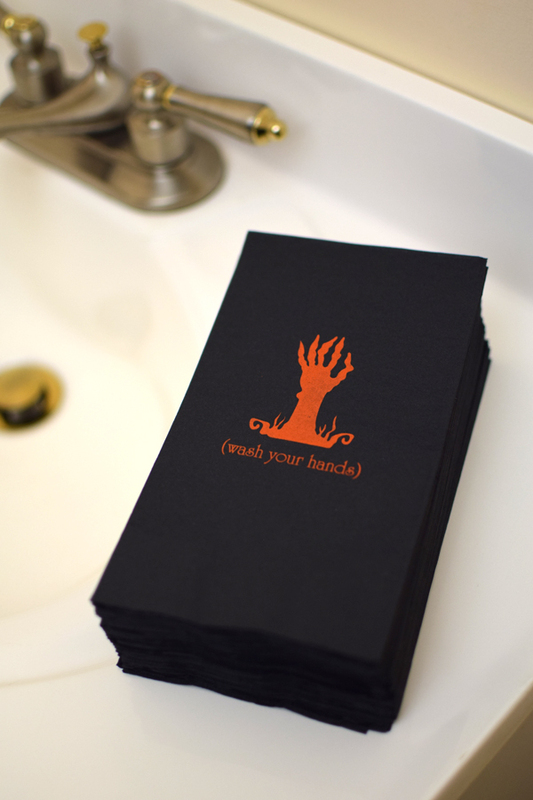 Add the finishing touches to your spooky bathroom decor with these custom printed disposable bathroom napkins. This company was incredibly easy to work with. They helped rush my orders, which included custom trademarked art. I felt like I was dealing with a small local shop, not an impersonal internet company. I will use them for all custom ordered items in the future. My only reason for 4 stars is that paper is not the top quality linen like" paper. It is a relatively thin napkin product, but the art turned out beautiful.